It sums up Fife Flyers right now. There has been no fuss, and precious little fanfare, but, week in, week out, the team has plotted a very steady course through the EIHL, the conference and the Challenge Cup. And the really exciting part is, the best is, I think, yet to come. Generally, no-one talks about Fife in terms of titles or silverware. It’s always the big four - Nottingham, Cardiff, Belfast and Sheffield. But with every passing weekend, it’s clear that there is a fundamental realignment within the EIH. The natural order of things is under threat. Take it as read that Steelers will come good again – they’ll shake up the room, cancel more days off and coach Tommo will go through as many hairdryers as he can get on special offer at Argos until he gets the results he, and the fans, want. But, it runs deeper than Steelers not playing well. The expansion of the EIHL to 12 teams has opened this league up beyond expectations. 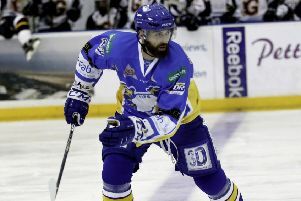 Last weekend may well have been a ’changing of the guard’ moment as newcomers Guildford Flames took four points from their Scottish double header and cruised past Sheffield to move into the top four. Flames’ work ethic has impressed many, they have a potent first line and, they are clearly relishing life in top flight hockey. But then you look at Flyers. Seventh spot and sitting pretty, but those games in hand are the key to how their season could end. They have up to six matches on the cluster of clubs around them - that’s a potential 12-point haul which could easily propel them to the very top. And then you start to drill down into their team stats – and an area reserved for the geekiest of hockey geeks actually throws up some interesting thoughts. Those pests Chase Schaber mentioned? They’re also one heck of a hard-working outfit all operating off the same page of the book. There was another small but fascinating insight into the psyche of this team and how things are ticking over in the dressing-room. That quick change of one word told you a lot about how much has changed. These pests are smart enough to anticipate the pitfalls. Of course, nothing has been won yet. No silverware has been paraded, but there is absolutely no doubt the Flyers of 2017/18 have the potential to make the showcase finals. The conference is step one, and they are in complete control. The Challenge Cup? It was pretty clear Belfast seemed happy to settle for a tie last weekend, and may regret that as they watch the tape of how Fife methodically picked Sheffield apart last Sunday. The second leg in Belfast on January 9 could be a fascinating game - one to anticipate with real excitement. On web forums the words ‘’title contenders’’ are starting to be used in relation to Flyers. Again, there’s a heck of a lot of hockey to be played, and the team’s approach is the simplest of all. One game at a time. Staying healthy is key, luck plays its part, and turning the rink back into a noisy fortress is, for me, absolutely key in 2018. All those elements – and a fair few more – need to align come January when coaches around the EIHL will really start to take stock of the challenge from the Kingdom. And staying under the radar in the meantime probably suits these pests ... the kind that truly don’t quit.